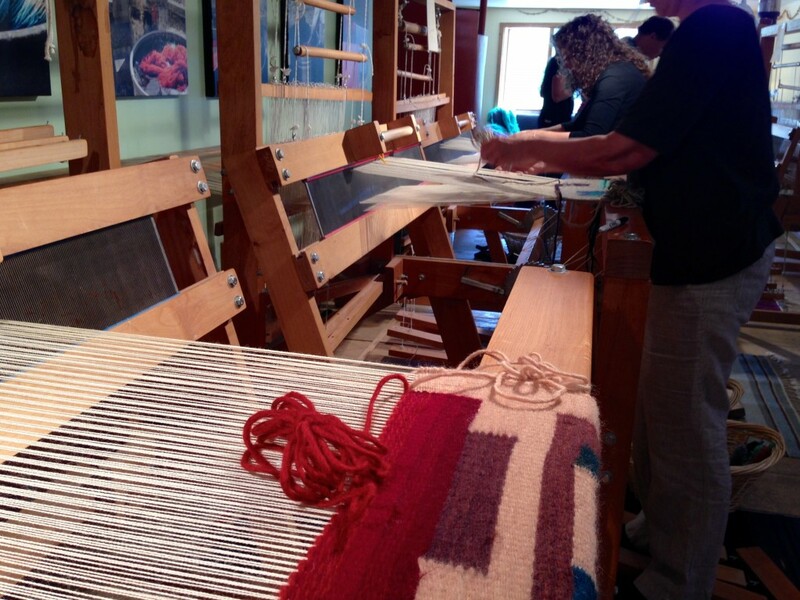 I just spent three days at Weaving Southwest in Arroyo Seco, New Mexico, studying tapestry techniques with Teresa Loveless. It was a great experience! “Habitat, a Study in Verticals” is a fun and informative class, with exceptional personal attention given to each student. The looms are Rio Grande walking looms that were designed by Teresa’s grandmother, Rachel Brown. You weave standing up! 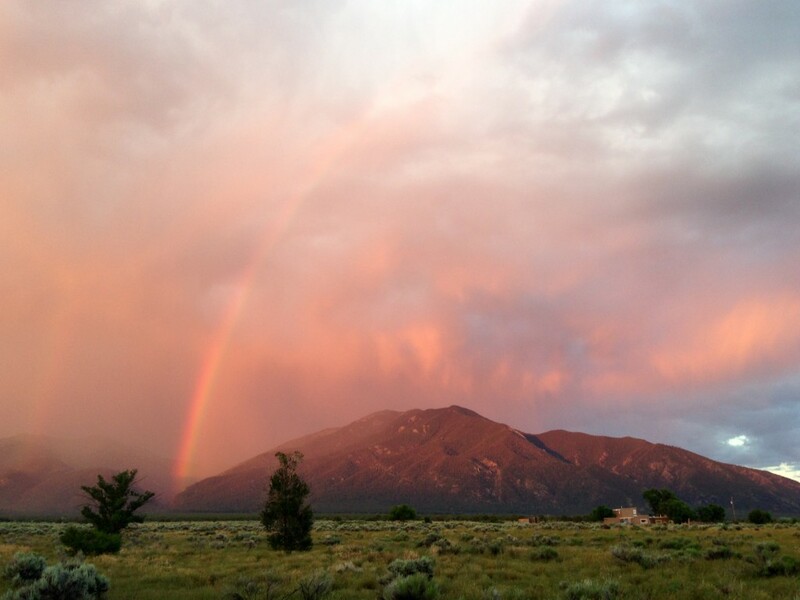 This stunning double rainbow over the mountains greeted us on our first evening in Arroyo Seco. Images like this inspire countless artisans in New Mexico. The emphasis for this class is vertical joins in weft-faced plain weave tapestry. Teresa uses memorable words and phrases that help students remember techniques. Just ask me about threads kissing! 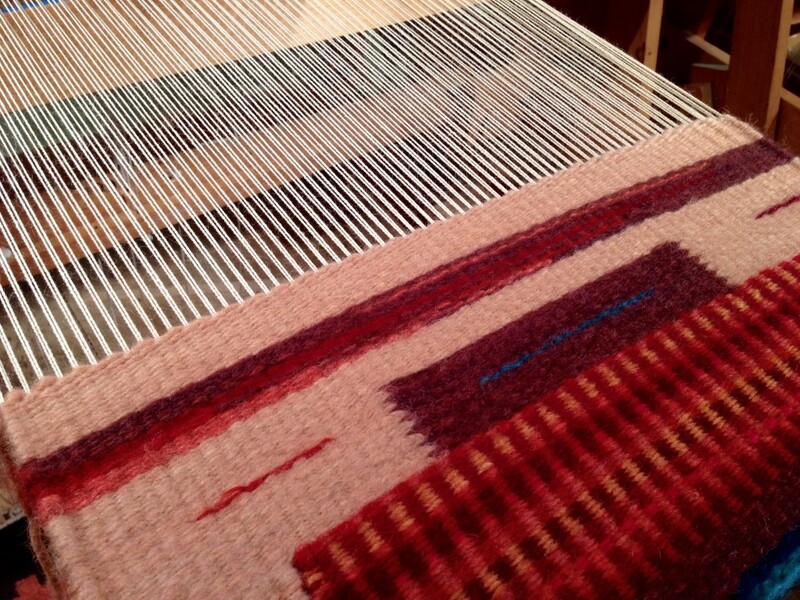 Besides the vertical joins, we also practiced other tapestry and shuttle techniques, including pick and pick, color gradation, and hatching. Finishing techniques, like sewing in loose threads, stitching slits, braiding fringe, and blocking the finished piece were covered at the end of the last day. Standing in front of the Rio Grande walking loom I used at Weaving Southwest, after weaving the first portion of my design. Five students in the class each have a loom. 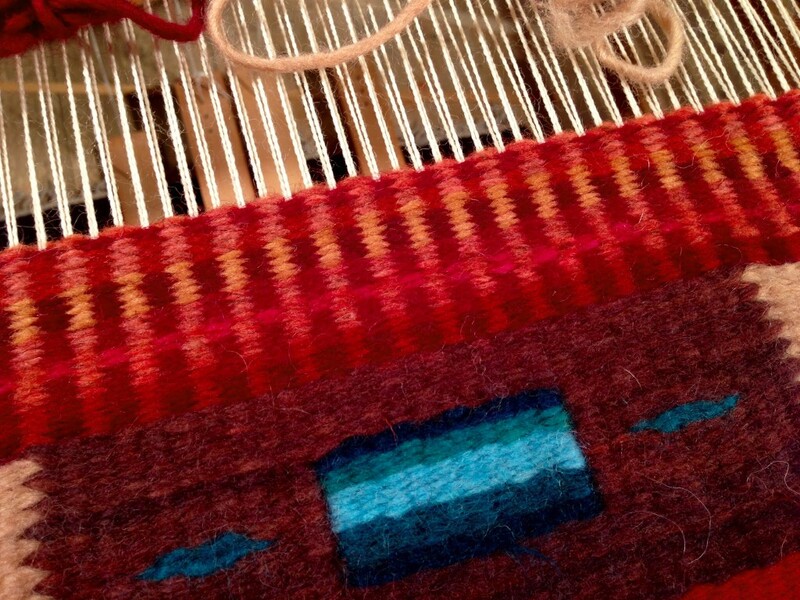 We had a fabulous selection of Weaving Southwest’s own rug wool in rich, fabulous colors. To take advantage of the hand-dyed wool’s unique features, I chose background colors that had an almost variegated appearance. 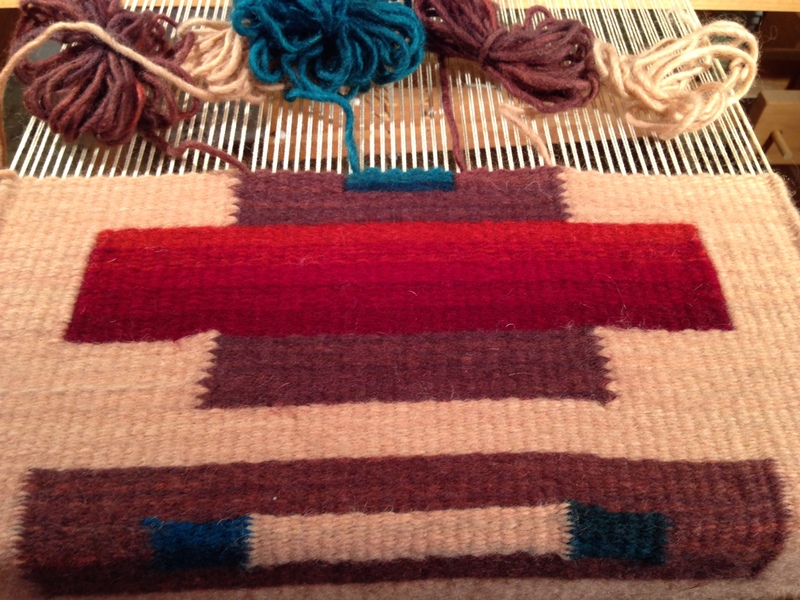 Pick and pick, creating vertical stripes of color, is one of my favorite techniques. Maybe I will make an entire wool rug using pick and pick. Just enough time to add some hatching at the end portion of my piece. Fun! I will show you my finished piece in an upcoming post. And I will share a personal conversation I had with Teresa, talking about her big dreams. May you learn something beautiful. Thank you, Sharon! I love the gorgeous yarn that Teresa Loveless made available to us for the class. They dye all the colors there at Weaving Southwest. Teresa is planning to start online classes, so maybe you can take a class! 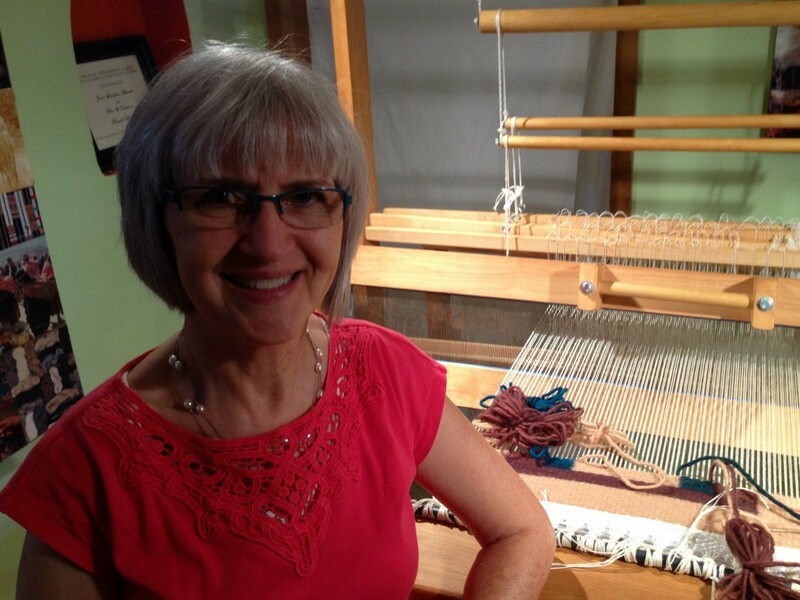 Contact Teresa through Weaving Southwest to get more information. what a fabulous site. Really love your rugs. Makes me want to try weaving one . Hi Linda, You should try it. It’s a lot of fun!